Think running and dancing are not your cup of tea in terms of exergaming? Well now all you have to do is grab your iPhone or Ipod Touch and Row yourself to better health and more upper-body activity. We are trying this now and will record a video for the rest of the world to chuckle at/with us. After a couple of races my arms are a little tired, but as usual as a social game with friends you can't deny it's enjoyable gameplay. First, download the free Boat Remote. Then go to the Pirata Boat Race page. When you start the game, you will need to choose the ship you want to control by scanning a screen QR code with your iPhone. 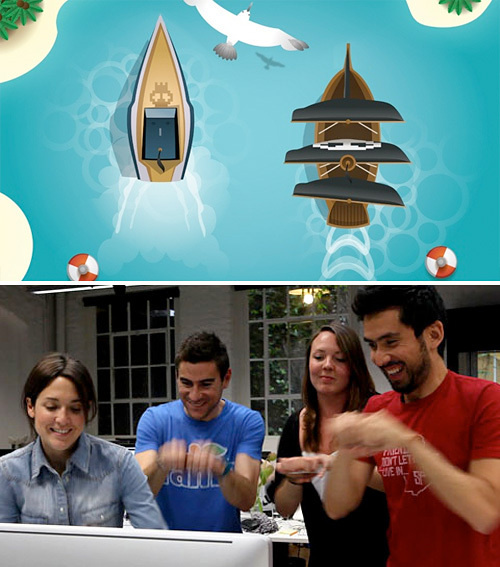 Then, you only need to row, row, row your boat, frenziedly against the other team until one of you wins. For more laughs check out this video! Ha!